One last photo of the Patullo Bridge and then I'll have to find another city's bridges to put in my blog. There are so many new and interesting bridges in Vancouver that I'd like to come back one day. In particular, I'd like to study the extradosed bridges that were recently built. An extradosed bridge is a cable-stayed bridge with short towers. Since the cables have a smaller vertical component, they are much less effective and it's more like a prestressed girder bridge. Just 72 years ago, the Patullo Bridge was a brand new structure and considered the height of modernity. Now, with its 10 ft traffic lanes and aging structural members, it's considered antiquated and will shortly be replaced. 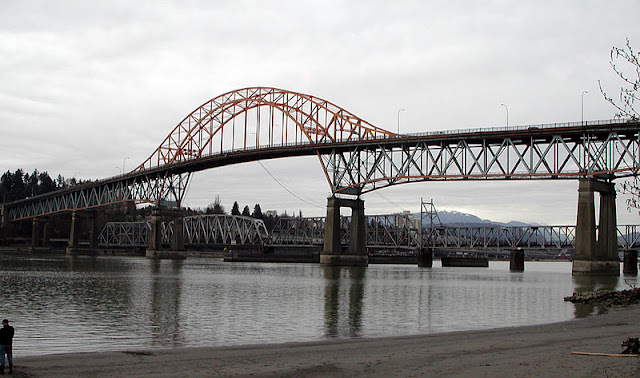 In 1937, it cost $4 million to build and was named after the premier of British Columbia. I wonder if the works of Calatrava will prove to be equally short lived? Most bridges have about a 75 year life-span, unless the public is willing to make a special effort to preserve them. In 2009, the Burnaby Village Museum celebrated the bridge's 1937 grand opening with a special show and luncheon. Information from the museum's show is available online. Vancouver's Bridges: Patullo Bridge (2) by Mark Yashinsky is licensed under a Creative Commons Attribution-NonCommercial-ShareAlike 3.0 United States License.